I set my PCI USB HUB (based on VIA chipset) to share a usb device to one of my VM's. The second device i want to share is independent from USB HUB, PCI Wireless card to be accessible from my second VM. Everything seems to be fine, the device is available for passthrough. But after adding it to the VM#2, i can't power it on. 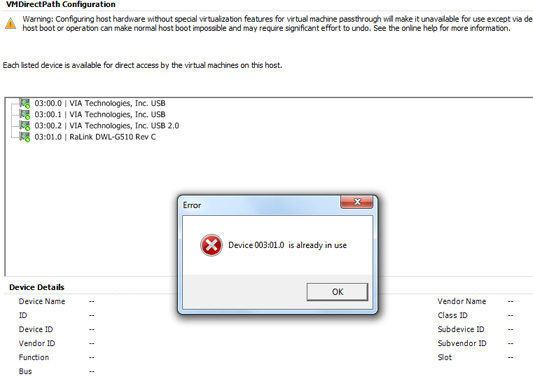 Hello, the devices are all on the same bus (03) and thus VMDirectpath doesn't allow you to share between 2 VMs because it can't individually reset the devices (i.e. if it has to reset the device, everything on the same bus gets reset). You could try to edit this file - /etc/vmware/passthru.map - adding a PCI id entry for the device and then using a reset type of flr or d3d0. Should i add to devices, or just the one i want? I tiried before posting according to post on vm community forum, but with only 1 device in d3d0 mode. Last edited by tompl on Wed Nov 11, 2009 2:23 am, edited 1 time in total. You might try a different slot. Otherwise try adding all the devices to passthru.map. In the beta things could get a bit unstable after editing the file so make sure you have backups. You can use the reset option if you have to blow and your ESXi config but save VMs - http://www.vm-help.com/esx40i/reset_config.php. I have only 2slots for pci. This two entries are my pci devices. Always get the same error. The only solution for me, is to buy a pci-E wifi card which will be running on a diffrent bus. You could also get a PCI-e USB card. That's what I used here and it was pretty cheap - http://www.vm-help.com/esx40i/VMDirectP ... _Setup.php. I have alreday bought an Abit Air Pace Wifi for 13$. It seems that i wrote that post a little bit hurry. I can passthrough this device, and linux/windows sees that device(can install driver, put in on/off), But when i trying to find an network, nothing... Next step i have done, it was to make a temporary ad-hoc network on my laptop and VM. I coulnd find my VM's ad-hoc network on my laptop, neither on my VM laptop's ad-hoc. Next, i tried to verify that the card is working at all. So i booted directly from my second hard-drive with windows xp. I could find a networks.. I also checked my second PCI wifi card to passthrough to a VM. And it worked fine, i could connect to my VM's ad-hoc and find other networks. This all, makes me very pissed off. I bought this card specially to make a software ap mode on a vm. That's unfortunate. When you have a Windows VM running does the device show as working properly in device manager after you install the driver? Yes. Even Abit software for this card shows it. The transfer speed of this device is 1mpbs. I think this i a problem. And all tx packets are dropped. When using passthrough devices with a Linux kernel version 2.6.20 or earlier, avoid MSI and MSI-X modes because these modes have significant performance impact.